Learn to read, spelling, grammar and typing. 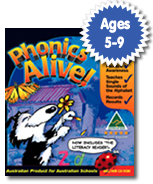 Phonics Alive! 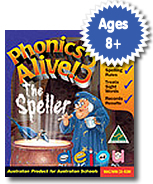 Phonics Alive! is not a cost, it's an investment. It allows young minds to focus on future success. Education is for life! The Phonics Alive! family is a unique concept in structured Phonics education designed for use in the classroom and at home. 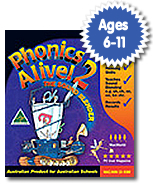 Phonics Alive! 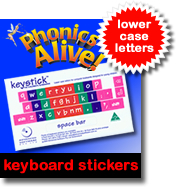 introduces all letter shapes and sounds. It can be used with children at a very early age, through to older children with learning difficulties or those for whom English is a second language. 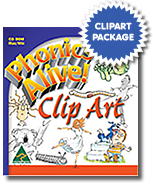 HOME or SCHOOL Phonics Alive! A method of teaching children to read by training them to associate letters with their phonetic values. The ability to use language proficiently in order to read, write and communicate. To know how to spell correctly is an important stage of advancement in one’s future. The science of sounds is the beginning of learning all languages. The ability to decode a word phonetically will develop this skill. Hearing the mother tongue begins at birth. Learning the mother tongue begins with teaching. 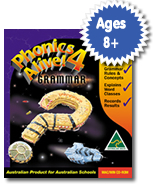 Teaching the mother tongue begins with phonics. Blending sounds is sometimes difficult to learn but important to understand in order to read, write and spell correctly. A system of rules teaching the proper use of language in regard to its correctness and social propriety. Parents helping their children to learn in the home environment, is a wonderful way to enhance their children’s education. Teaching non-English speaking students to learn our language correctly is imperative for the well-being of their future. The inability to understand written or printed words when seen. Often called word-blindness. Lack of the necessary skills required to understand the learning process of how to read and write. 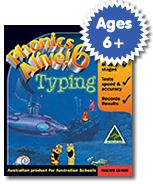 A must for all young ones to learn to type correctly before developing incorrect typing habits.